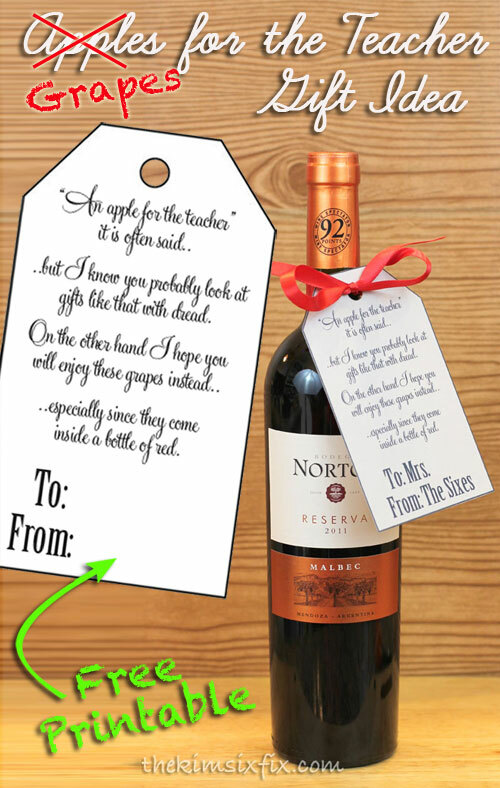 Give A Teacher What They Really Need: Wine! It is the last week of school before Christmas break and I am getting my teacher gifts all lined up. I have done a lot of different teacher gifts over the years and I’m always trying to get away from the ‘cutesy’ gift ideas that teachers don’t actually want or need. When I surveyed my teacher friends for what they actually wanted, and what would show them that a parent appreciates them for all their hard work, I got the same tongue in cheek answer over and over: BOOZE. I’m sure being a teacher can be a rewarding and wonderful experience, but that doesn’t mean teachers don’t have ‘those days’ where they just want to kick off their shoes and have a nice glass of wine when the day is finally over. It is with that rationale that I decided to GIVE THE PEOPLE WHAT THEY WANT! “An apple for the teacher"
gifts like that with dread. will enjoy these grapes instead..
inside a bottle of red. I’ve included this file as a JPG so you can print it out and your add name for a quick and easy teacher gift. Click HERE to download. I have also included that Print and Cut-ready studio file HERE if you would like that version. I added it to a bottle of Malbec with a simple red ribbon. And presto! An instant teacher gift. I know my kids teachers will appreciate the humor. Anyone who has ever been trapped in a room full of 26 third graders would!